America’s wild horses and burros are at great risk right now. Please join us Tuesday April 25 at noon (California Time) to #pray for the safety, protection and freedom of America’s wild horses and burros. Lobbyists are in Washington greasing palms to get what they want: slaughter, killing, pesticides for birth control and sterilization for extinction. This is not what the public wants. We love our wild horses and burros. We want them protected and forever free. Sign and share the petition demanding a headcount and congressional investigation: https://www.change.org/p/u-s-senate-investigate-the-wild-horse-burro-count-in-captivity-and-freedom This will help stop trafficking wild horses to slaughter and extinction! There is a lot going on behind the scenes now in Washington. This petition is making an impact. It’s time for us to let more people know about the fake inventory before more roundups, experiments, sales, etc. are allowed to destroy the last wild herds in America. Together we can turn this around. Thank you and bless you. © Anne Novak, all rights reserved. #URGENT: File a complaint against Nazi-like population control experiments on America’s wild horses! The clock is ticking. Oregon State University isn’t stopping. They are going ahead with their Nazi-like population control experiments on wild mares and a lot of them are pregnant! The experiments were encouraged by a bunch of sick pro-slaughter, pro-cattle activists that work in darkness to bring the “final solutions” to America’s underpopulated wild horses and burros. These people have no soul. They have no empathy for the suffering these horrible experiments will inflict on WILD horses . . . wild animals . . . wildlife . . . that the law was supposed to protect. Take action right now and fill out this Animal Welfare Complaint: https://www.aphis.usda.gov/aphis/ourfocus/animalwelfare/complaint-form. Mention that the procedures used to sterilize wild horses in the experiments at Oregon State University and elsewhere are cruel. Let them know that wild horses are underpopulated and the basis for these heinous experiments is false. Underpopulated wild horses and burros in America don’t need population control or birth control. America’s wild horses and burros need your help to live and survive on public land set aside for them in 1971–the public sanctuary that is open 24/7 at no charge. The wild ones need YOU to go to your elected officials’ home offices and push for their protection. Please also send an email to your congressman/woman and your 2 senators. Their contact information is here: http://www.contactingthecongress.org/ Short handwritten letters have the most impact as elected officials see them representing the opinion of 1000 voters. Ignore anyone who says birth control is a tool in the stupid toolbox. Who’s toolbox are they talking about? Ignore the spin doctors claiming they are overpopulated. It’s a lie. The Bureau of Land Management’s (BoLM) claim there are 67,000 wild horses and burros combined in all western states is based on no more than an inflated guess. The BoLM have no headcount and no evidence according to the National Academy of Sciences. Even if there were 67,000 wild horses and burros left in the wild that would be too few to survive serious changes in climate, disease and environmental disaster. Do you want to see our majestic symbols of freedom and the American spirit become extinct forever? No you don’t, so take action. Your voice counts. America’s wild horses and burros are being wiped off public land because greedy people and corporations with no conscious want to exploit the wild ones’ territory for profit–big profit. These people who are out for big money need to find the win-win, respect the environment and learn to work with–not annihilate–the last free roaming wild horses and burros. After all, wild horses prevent wildfires that could hurt their money making projects (oil and gas wells, solar energy zones, mining, etc.) These people should realize cattle will never roam like wild horses do and therefore cannot replace the wild herds for fire prevention. Tell your friends, family, co-workers and neighbors what’s going on and tune into our website daily for updates on the fight to save America’s wild horses! www.ProtectMustangs.org There are a lot of ways you can help by using your voice right from your computer. If we all don’t do something now then hundreds of wild horses will be cruelly carved up in Nazi-like population control experiments to rid the land of wild horses. Our beloved wild ones have been wrongfully labelled “pests” in the Pesticide PZP EPA application. Also based on the overpopulation lie, thousands of wild horses could end up at slaughter soon if they are not all accounted for and placed in safe homes. Your elected officials need to be contacted regularly by email, handwritten letters and in meetings to stop the abuse against wild horses and keep them living in real freedom. . . in the wild. It’s time to send an email requesting an appointment to get your elected officials involved in protecting America’s iconic wild horses and burros. Yes really protect them–not forcibly drug them with Pesticide PZP or sterilize them. Do you realize YOUR voices in government have been fed a bunch of lies based on a false premise from other elected officials, lobbyists and traitor “advocates” as well? Follow the money . . . Then move beyond that to real “solutions” to protect real freedom. Make your voice heard. Hundreds of pregnant mares were moved Friday January 22, 2016 from Palomino Valley Center (PVC) outside of Reno to the closed door facility in Fallon called Broken Arrow aka Indian Lakes. Does BLM intend on using the pregnant mares from Beatys Butte in the horrible Nazi-type sterilization experiments in Oregon? These pregnant mares and members of their herd seem to have been rounded up because Country Natural Beef, a supplier of Whole Food Market, was pushing for the roundup. Do they want the federally protected wild horses gone so they can use the public grazing land for beef? Protect Mustangs officially requests the mares from Beatys Butte and all the mares at the Fallon facility be put up for adoption–not experimented on! STOP the cruelty now! These are America’s icons of freedom. Americans must not allow tax dollars to fund experiments reminiscent of Dr. Joseph Mengele. The rights of American wild horses are being violated. Pregnant mares especially must never be used in sterilization experiments! There are no accurate head counts of wild horse populations, many herd management areas have no wild horses left on them, and the BLM’s horrible customer service and poor marketing are the reason wild horse adoption has dropped. It’s as if the BLM wants their adoption program to fail. Any and all experimentation based on the overpopulation myth must be stopped! The BLM is proposing to conduct three research experiments “investigating the safety and effectiveness” of three separate methods of surgical sterilization of wild horse mares. The three proposed methods include ovariectomy via colpotomy (in photo above), tubal ligation and hysteroscopically-guided laser ablation of the oviduct papilla. The proposed studies would be conducted under financial assistance agreements with Oregon State University (OSU), with OSU staff serving as the principal investigators of the research. The three experiments combined would involve approximately 225 wild horse mares previously rounded up and removed from BLM Herd Management Areas (HMA). All three studies would be conducted at Oregon’s Wild Horse Corral Facility in Hines, Oregon and would be planned to begin in February 2016 with an estimated completion date of September 2020. This environmental assessment (EA) is a site-specific analysis of the potential impacts of the proposed action. Your tax dollars are paying for the BLM’s programs, roundups and experiments if allowed to continue. There is no overpopulation of wild horses. They are underpopulated on the vast acreage of public land in the West. BLM’s harvesting model based management via roundups is disrupting herd dynamics and increasing the birthrate. BLM’s allegations of overpopulation are fraudulent based on false data. They don’t even account for the correct mortality rates in the wild. Predators should not be killed off and if there are none left then they need to be reintroduced for the thriving natural ecological balance. Wild horses are a return-native species that help reduce catastrophic wildfires and create biodiversity. We need the herds to reverse desertification. The BLM is creating a false overpopulation crisis to cash in on wild horses as laboratory animals for fertility control experiments while reducing the herds to nonviable levels. GonaCon™, PZP, SpayVac® are all pesticides that classify wild horses erroneously as pests–ultimately sterilize them and are not needed because wild horses are underpopulated. There are no “excess” wild horses. The BLM is trying to manage America’s wild horses to extinction. Send your elected officials a handwritten letter and make an appointment to go in to see them. Share this with everyone you know. Check back on our website for daily updates. Together we can stop this and turn this around. 1.) I object to using my tax dollars to experiment on, forcibly drug with PZP and / or sterilize America’s wild horses. 2.) I do not want federally protected wild horses to be used for a research experiment using radio collars, devices in tails and spaying America’s federally protected wild mares. Sterilization is a form of harassing wild horses and against the law. 3.) The wild horses found in the White Mountain and Little Colorado HMA’s are not excess according to the Wild and Free-Roaming Horses and Burros Act of 1971. There is only 1 wild horse per 6,000 acres in White Mountain. The BLM fraudulently inflates population growth (http://protectmustangs.org/?p=8551) and never performs a real headcount. 4.) I support natural selection and I am against fertility control of any kind because wild horses deserve to live on public land set aside principally but not exclusively for their use. Allowing more than 50 to 1 units of livestock to wild horses is unfair and goes against the 1971 wild horse protection act. 5.) Fertility control, such as with PZP and spaying, will destroy the herd’s genetic viability, wreck havoc on their behavior and social structure so therefore I am against it. 6.) I want to be able to come to Wyoming to see and photograph the White Mountain and Little Colorado wild horse bands with foals exhibiting natural behaviors–without radio collars and other devices–and definitely not sterilized. 7.) 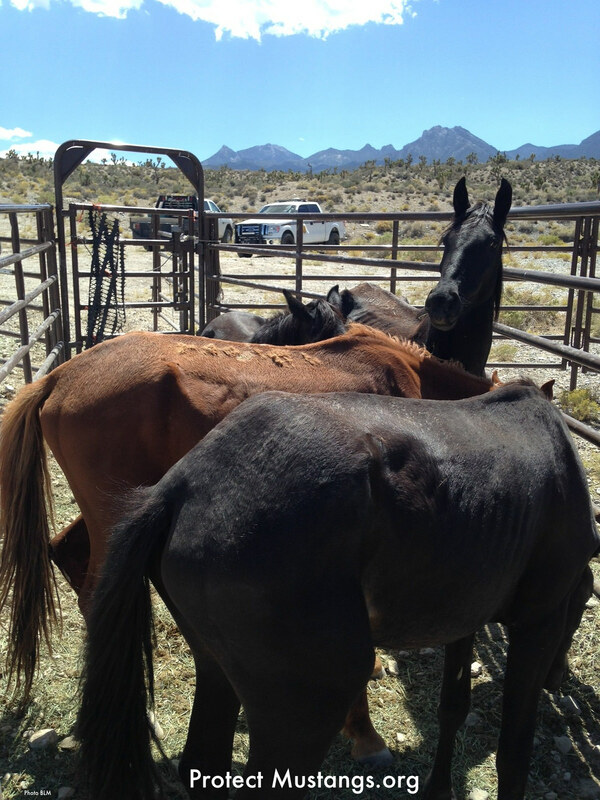 PZP sterilizes after multiple use and I do not want these wild horses sterilized. Ms. Wilder is disinformed. PZP does not “cause eggs to reject sperm.” That hypothesis has been disproved. PZP is a registered pesticide whose mechanism-of-action is to cause auto-immune disease. PZP tricks the immune system into producing antibodies that target and attack the ovaries. PZP’s antibodies cause the mare to suffer ovarian dystrophy, oophoritis (inflammation of the ovaries), ovarian cysts, destruction of oocytes in growing follicles, and depletion of resting follicles. Not surprisingly, estrogen levels drop markedly as the ovaries are slowly destroyed. But PZP’s adverse effects are not limited to the individual animal. As a recent study — which included the Little Book Cliffs, Colorado herd and the McCullough Peaks, Wyoming herd — found, PZP extends the birthing season to nearly year-round. Out-of-season births put the life of the foals and the mares at risk. Further, the same study disclosed that the pesticide causes a delay lasting 411.3 days (1.13 years) per each year-of-treatment before mares recover their fertility after suspension of PZP. However, some mares never recover — they are left permanently sterile, and quickly too. Indeed, yet another study found that sterility could occur in some mares from just three years of PZP injections or from just one treatment if the pesticide were given to a filly before she reached puberty. Because PZP messes with the immune system, it ironically works “best” — sterilizes faster — if the mare has a strong immune system. But, conversely, PZP may not work at all in mares whose immune function is weak or depressed. So, the pesticide discriminates against the very horses that Nature has best equipped for survival against disease while favoring and selecting for the immuno-compromised. Worse yet, tests performed via radioimmunoassay indicated that PZP antibodies are transferred from mother to young via the placenta and milk. The transferred antibodies cross-react with and bind to the zonae pellucidae of female offspring, as demonstrated by immunofluorescent techniques. But there is no need for PZP or any other population-reduction measures. BLM’s wild-horse overpopulation “data” is a fraud. Reviews of BLM’s year-to-year growth-estimates for various herds disclosed biologically-impossible growth-rates. For instance, just recently in Oregon, BLM claimed that the famous Kiger herd’s population grew from 21 horses to 156 horses in just four years — an increase of 643%. Stealthily inserting bogus birth-rates into the data, then wrongly equating the birth-rate with the population growth-rate, and failing to factor in the mortality-rate — that is how BLM creates the false impression of a population-explosion. Another ruse BLM employs is restricting maximum herd-size below minimum-viable herd-size. Then, whenever a herd is made to appear — via false figures — to exceed the arbitrary management level, BLM screams “excess!” and declares an immediate need for mass-removals and sterilizations. It should be noted that more than 70% of the herds are “managed” below minimum-viable size, including Spring Creek Basin.